Tag line: "Four Days, Three nights, Two Convertibles, One City"
“I want it to be seen as one of the great movies of all time, and one of the most hated movies of all time”. This is what director Terry Gilliam said while promoting 1998’s Fear and Loathing in Las Vegas, and based on the reactions of critics and audiences alike, I’d say he got his wish! While a few pundits undoubtedly enjoyed the film (Empire Magazine went so far as to rank it 469th on their list of the 500 Greatest Movies Ever), some reviews were positively scathing. Roger Ebert, writing for the Chicago Sun-Times, gave Fear and Loathing in Las Vegas one out of four stars, and called it “a horrible mess of a movie”, while Mike Clark of USA Today declared it “simply unwatchable”. There were audience members who agreed with the critics; a co-worker at the time told me it was the worst film he’d ever seen, and the only movie he ever walked out on. Without a doubt, Fear and Loathing in Las Vegas is unusual and, at times, even off-putting, but Gilliam throws enough at us to keep us engaged, building suspense as we wonder what sort of mischief his depraved leads will get into next. 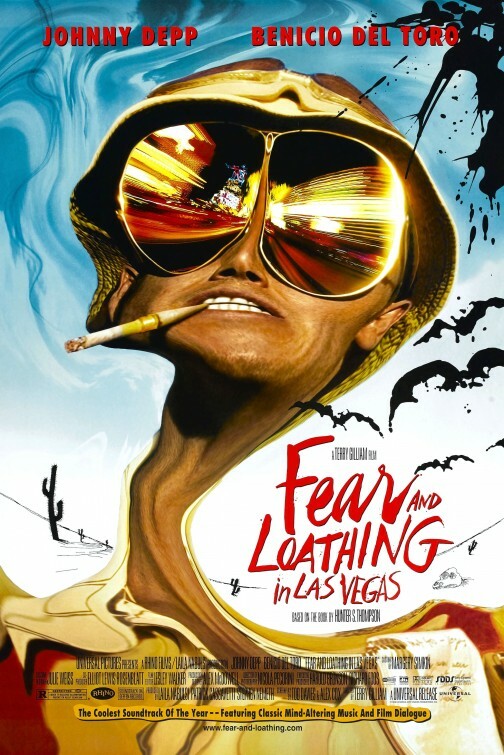 Based on the book by Hunter S. Thompson and inspired by his own experiences, Fear and Loathing in Las Vegas is set in the early 1970s and features the exploits of journalist Raoul Duke (Thompson’s alter ego, played by Johnny Depp), who, along with his Samoan lawyer Dr. Gonzo (Benicio Del Toro) and a trunkful of illegal narcotics, heads to Las Vegas to cover the Mint 400, a dirt bike race that lasts for several days. But truth be told, Duke doesn’t give a damn about the race, and instead spends his time in Vegas ingesting cocaine, acid, ether, mescaline, and a human adrenal gland! Along the way, Duke and Dr. Gonzo encounter a variety of people, including a hippie hitch-hiker (Toby Maguire), a teenage artist (Christine Ricci), and a pretty blonde reporter (Cameron Diaz). They even crash a DA’s convention, sitting in on attorney L. Ron Bumquist’s (Michael Jeter) impassioned speech on how best to spot a drug addict. Haunted by hallucinations and paranoia, Duke experiences everything that Vegas has to offer. But will he make it out of the city alive? With Time Bandits, Brazil, and The Adventures of Baron Munchausen, Terry Gilliam established himself early on as a master of the bizarre, and Fear and Loathing in Las Vegas went a long way to strengthen that reputation. In what is one of my favorite sequences, Duke and Dr. Gonzo – having just arrived in Vegas - are checking into a hotel. As they approach the front desk, Duke, who is already hopped up on drugs, begins to hallucinate; the face of the desk clerk, played by Katherine Helmond, morphs before his eyes, and the tacky patterns on the lobby rug leap off the floor and climb the walls. The horror continues when Duke and Gonzo make their way to the bar, where every patron transforms into a hideous reptile. This is but one of many strange scenes scattered throughout the film (a visit to the Bazooka Circus Casino is a definite highlight), with Gilliam constantly turning and tilting his camera, keeping us off-kilter as we experience first-hand his main characters’ warped view of reality. Depp and Del Toro are perfectly twisted as the two leads; the distorted manner in which they move while under the influence is often quite hilarious (At one point, Del Toro’s Dr. Gonzo slowly leans backwards, continuing to walk until he finally falls over). In addition, the film contains a number of memorable cameos. Aside from Maguire, Ricci, and Diaz, Ellen Barkin appears briefly as a waitress threatened by Dr. Gonzo, while Gary Busey portrays what is arguably the oddest highway patrolman in cinematic history. It’s easy to see why some people have a strong negative reaction to Fear and Loathing in Las Vegas. Its structure is chaotic, and it doesn’t so much tell a story as present the experiences of two individuals who show us time and again that they aren’t exactly pillars of the community (a scene in which Depp talks about prostituting Ricci’s teenage character catches us off-guard, though I’m sure that was the point). Still, despite its more aggressive elements, Fear and Loathing in Las Vegas is an effective critique of ‘70s excess, and even though I’ve seen the movie a few times now, I still get a kick out of it. 15 more movies! I can't wait to see #2,500! Quite honestly, you should try to get these published! Just caught onto to this yesterday, but awesome man! 2500!